Description: The lead unit of this coal train. Note the engineer in the cab. 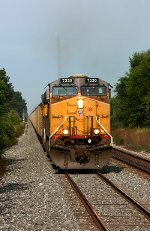 Description: A Union Pacific engine pulls a Norfolk Southern manifest through Temple. Description: Three GEs lead a grain train south elephant style. Title: E260 Sits on Main 2 waiting on a approaching westbound. 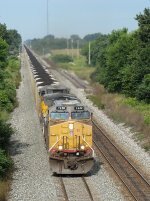 Description: DPU on an Eastbound Powder River coal train. I love this location. Acres and acres of truck parking. Title: UP 8923 Sit's still for the moment in the fresh snow.